Today's post/episode was inspired by a meme I created and posted this morning. 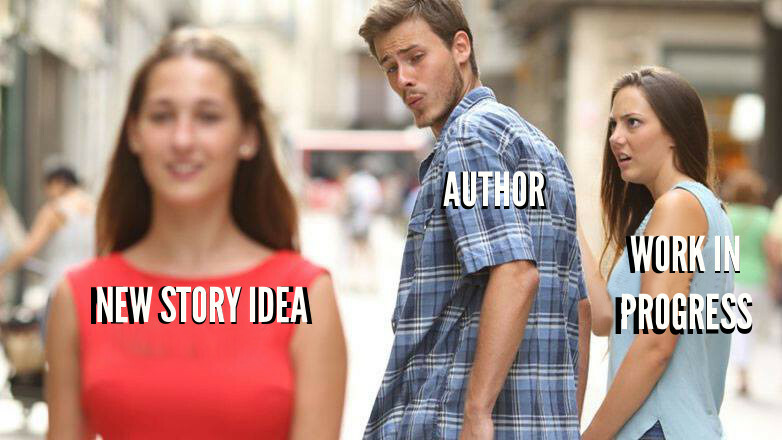 This particular stock image has been the subject of many different memes recently, so I thought I'd create one to reflect something I see often in the writing world. Imagine taking your car in for new tires. The technician brings your car back to you with only one new tire. "Sorry. I got the first tire on, but I'm really excited about that new jaguar over there." You hire a house painter. He finishes one wall. "Sorry, but I'm bored with this color, and frankly, your house is taking longer than I thought to finish. I'm going to stop here and hope the next house I paint is more exciting." You wake up in the recovery room after surgery. The nurse says, "The doctor did remove your kidneys, but she didn't do the transplant. She just wasn't feeling it today." Too many aspiring writers treat their careers the same way. If your goal is to sell your fiction, you might want to, you know, finish something. It's a bad habit. The more you quit, the easier it gets. What's more, you're training yourself to associate writing with that feeling of excitement we all get when we dive into a new novel. Inevitably, that feeling wears off and we incorrectly assume there's a problem with the WIP when that real problem is inside ourselves. If you're abandoning your novel for the sake of an exciting new idea, there's some underlying problem you need to identify and address. Maybe it's the excitement factor we discussed above. Maybe the story is broken and you need to fix it. Maybe its fear or insecurity. Maybe it's a lack of planning. Maybe it's simply a maturity issue. Whatever the reason, we'll never be successful if we don't learn to identify our problems and meet them head on. Finishing a novel is a process. It's hard work. It means working even on the days we don't "feel like it." 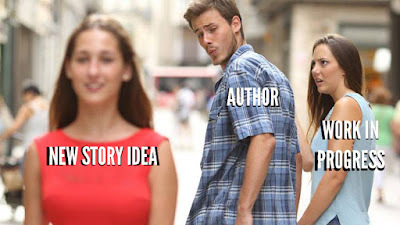 Reality check: that new idea is almost never any better than the idea that inspired the book you're already working on. Wait six months and return to that idea that excited you so much. I'll bet it now seems no better or worse than all of your other ideas. Ideas are of little value. It's about the execution, and that's what we learn to do when we finish our novel. People might be relying on you. Collaborations, work for hire, contract writing all require that an author deliver a quality product on time. If you develop a reputation for not finishing, you're finished. Completing a novel, even a flawed one or one about which we're not all that excited, feels amazing. Best of all? You can fix that novel through subsequent drafts. Just like quitting tends to feed on itself, so does finishing. With each finished novel, our confidence level and our skill set grows and we find it easier to finish subsequent books. We can actually start selling fiction! Stop believing in the "muse." Stop using the word "can't" when it comes to writing. (Unless your arms have been cut off and you don't own a dictation program.) Stop telling yourself that you have to "feel" a certain way in order to write. You're the same writer with the same tools at your disposal no matter how you feel that day or what your attitude is about your WIP. Treat it like a relationship. Writing a novel can be like entering into a relationship. It starts out new and exciting. There's an exploration process. At some point, familiarity sets in and the excitement wanes. Now comes a decision point- Do I stick with it, ride out the difficult parts, delve deeper, and make it work? Or do I walk away? If you're someone who keeps abandoning your manuscripts, stop walking away. Ride it out. Finish it. You'll learn and grow from the experience. Occasionally there will be a valid reason to abandon a manuscript, but if you're a serial quitter, you don't yet have the requisite experience to make that call. Get real about what's holding you back. If you're a pantser who is always abandoning manuscripts, maybe you need to become an outliner until you've developed the instincts to write without one. If you're an emotional writer who only works on ideas while they're exciting, try making yourself work a little bit every day. Or, start with short stories, move up to novelettes, then novellas. Get the experience of finishing something as you work your way up to longer works. But what about my great idea? I don't want to lose it. Write down every single thing I can think of relating to that new idea: the concept, characters, plot, theme, setting, flashes of scenes that have already come to mind. Everything. Then I close the doc and get back to my work in progress. That way I don't lose the idea. I might lose that overwhelming feeling of excitement that comes with a new idea, but that's actually a good thing, because that feeling never lasts. It won't get you all the way through a novel. It's critical that we detach our work habits from that feeling of euphoria. I recommend everyone do the same thing. Don't be sucked in by the new idea. Write it down, save it for later, and see if you're still excited about it once you've finished your WIP.